Like all good Doctor Who fans (and unlike the Doctor himself) I like lists. Most of all, I like visual lists, be they diagrams or graphs. 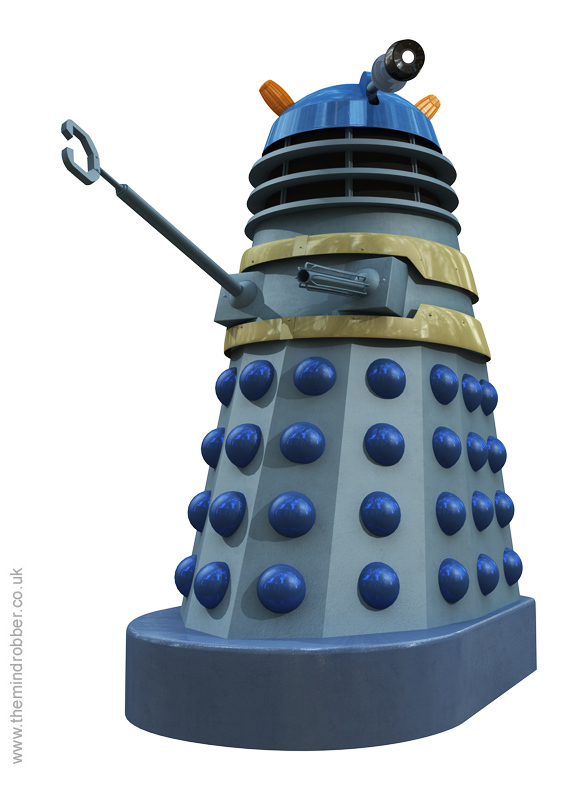 Part of that weird instinct of being a Doctor Who fan is to recycle information and imagery. Learning the details and repeating them to other people. 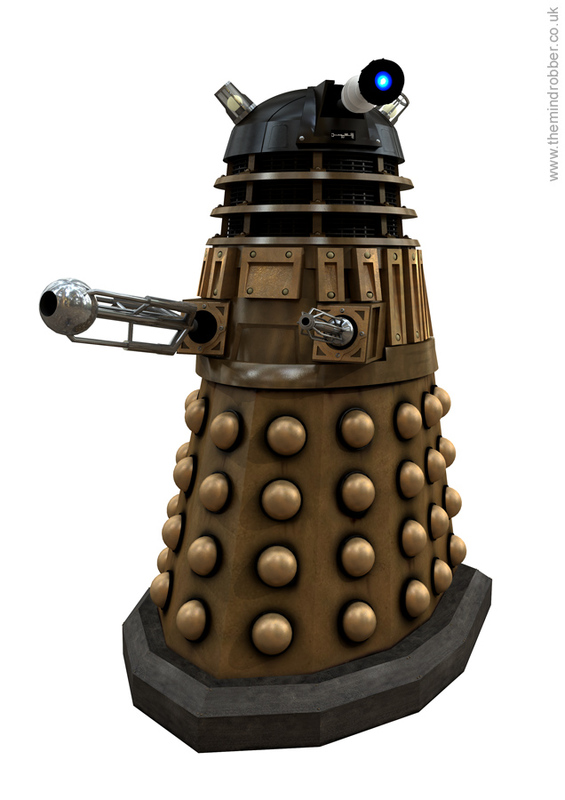 I do it with Dalek variants. 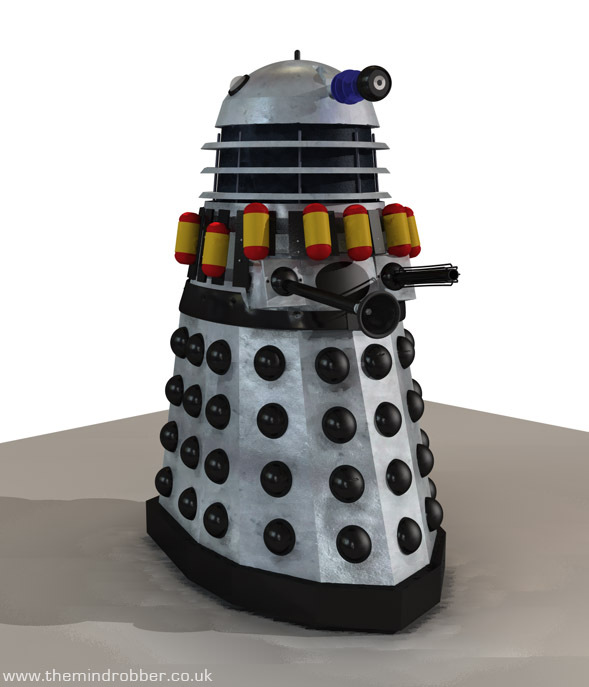 In 2012 I did a number of renders for Doctor Who Adventures which included the Imperial Dalek Emperor, the Special Weapons Dalek and various others that had been gaps in my library of models. They were then very useful for DWM 447. I enjoyed creating the Bronze Dalek Throne Room Guard from the new series. It has what looks like a gigantic gun, but I've seen it described as both a flame thrower and also a sensor array. I also created the original 60s Emperor. Below are older models from when I was trying to refine my modelling techniques in Cinema. These are a bit dated now and still very poly-heavy as I built them when I was less knowledgable. 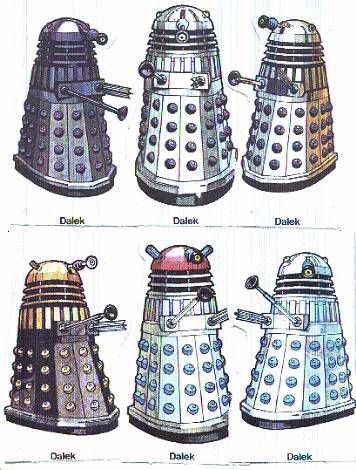 The above left is probably my favourite Dalek colour scheme, as seen in Death to the Daleks. I like how it echoes the original 1960s props but in monochrome. 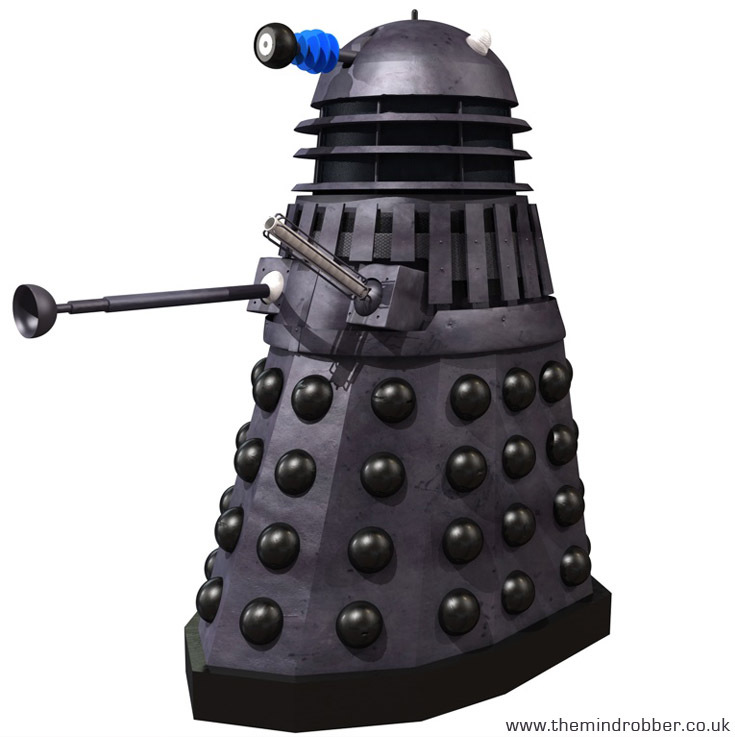 Above centre is the typical gun-metal colour scheme but this prop is based extensively on a particular one - the leader Dalek from Destiny of the Daleks, right down to the holes in the gun boxes. Still got my rubbish old sucker on that though. 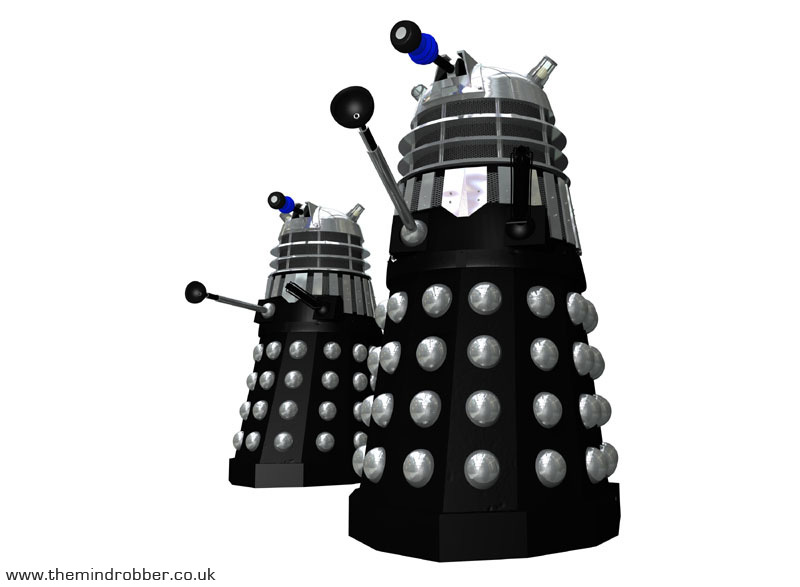 Above right is one of the subordinate Daleks from Destiny of the Daleks. Here are some more unusual props from the show's history. Above left features two props which share a curious and inter-linked history. 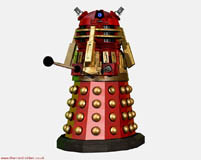 Having both originated from the Dalek films, the passed into the care of Terry Nation.Strangely enough, the Red Top developed its own strange little niche in non-canon Doctor Who history, since it featured in the Radio Times and also on on the Weetabix cards (see it here) as if it was part of the show's history.The 'gold' (why are they never truly gold?) 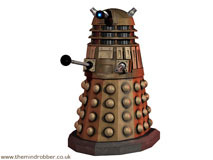 and black Dalek from Planet of the Daleks was also used to promote Seven Keys to Doomsday. 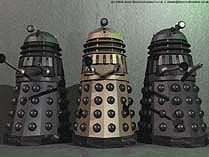 Above middle are the unique hybrid props used in The Daleks Master Plan stage play (see here). These renders were to be used on the promotional material but sadly due to the poster artist's hard-drive crash,the poster wasn't completed using this render. 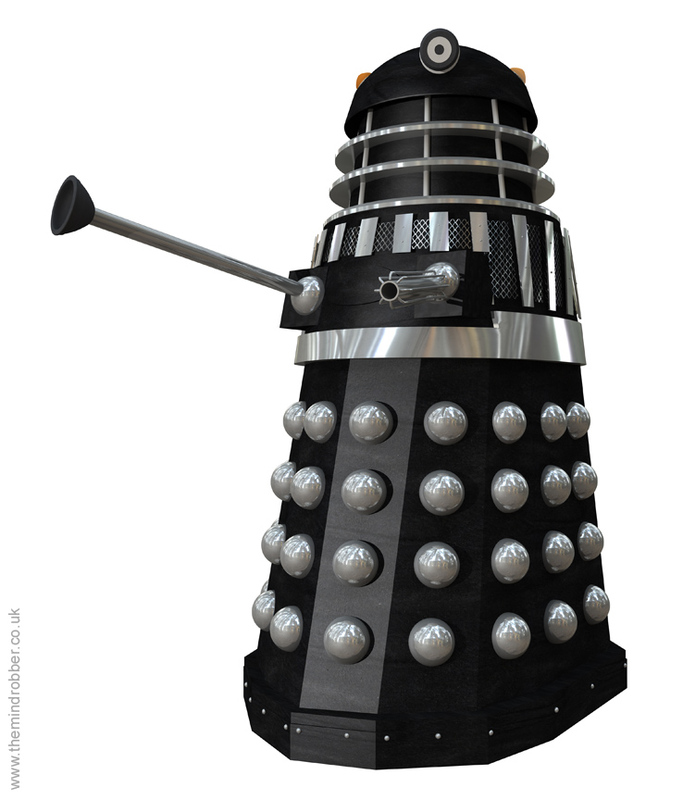 Finally above right we have the New Series Supreme Dalek, a sort of modern equivalent of the prop seen in Planet of the Daleks. 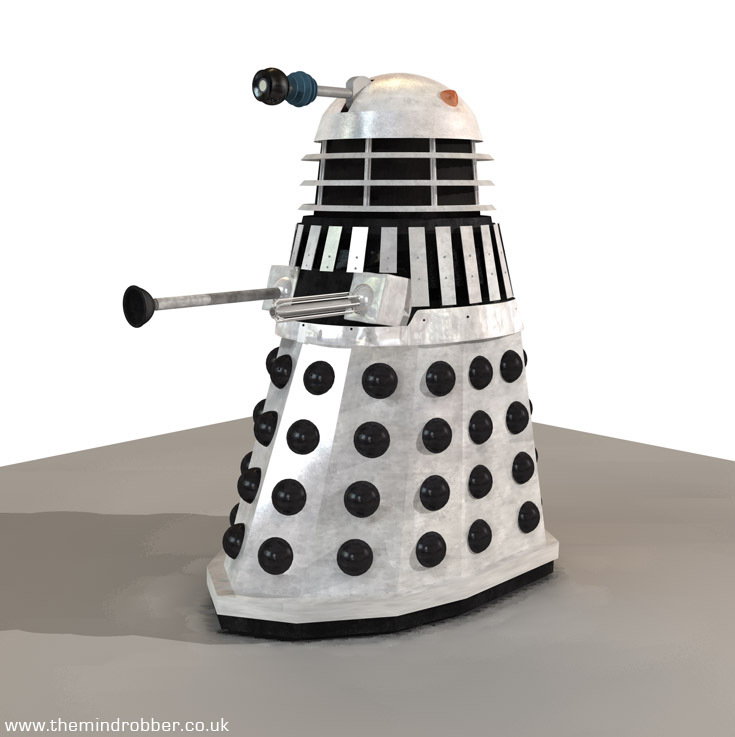 I think my first attempt at modelling a Dalek in 3D was around 1997 in a programme called Real 3D, however my lack of experience and the limitations of the software meant that I abandoned it. A few years later again I tried in MAX but the twist of the skirt and the complexities of the shoulders left me struggling once again. 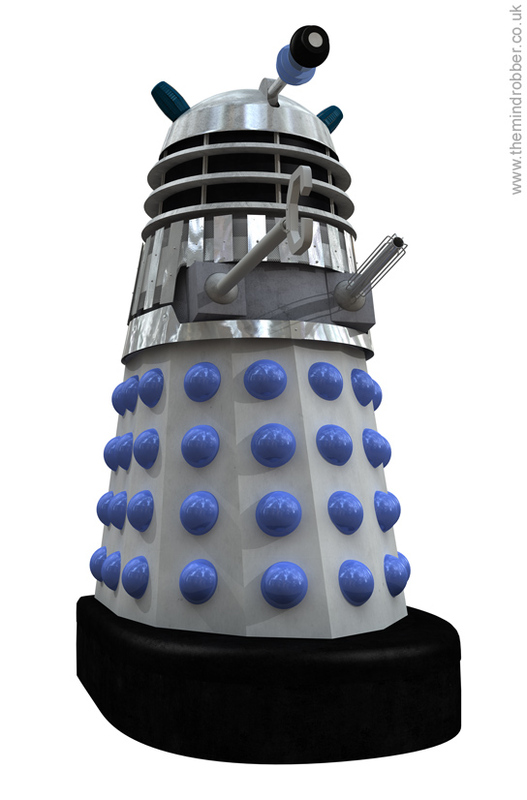 Finally in 2004 when I saw the New Series Dalek, I completed a model with which I was reasonably happy. 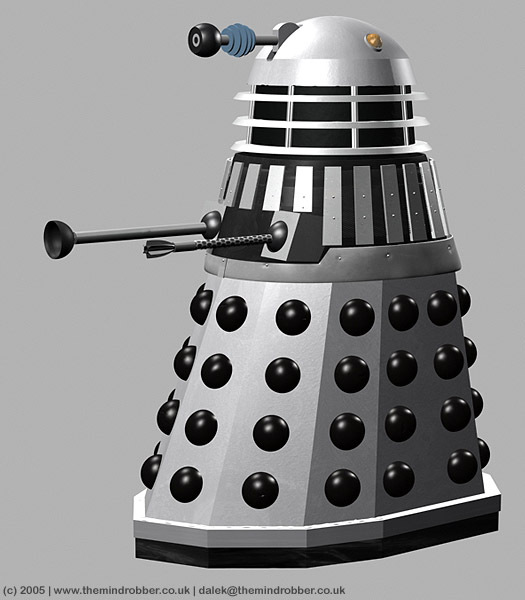 I then worked backwards to engineer classic series Daleks such as those below. 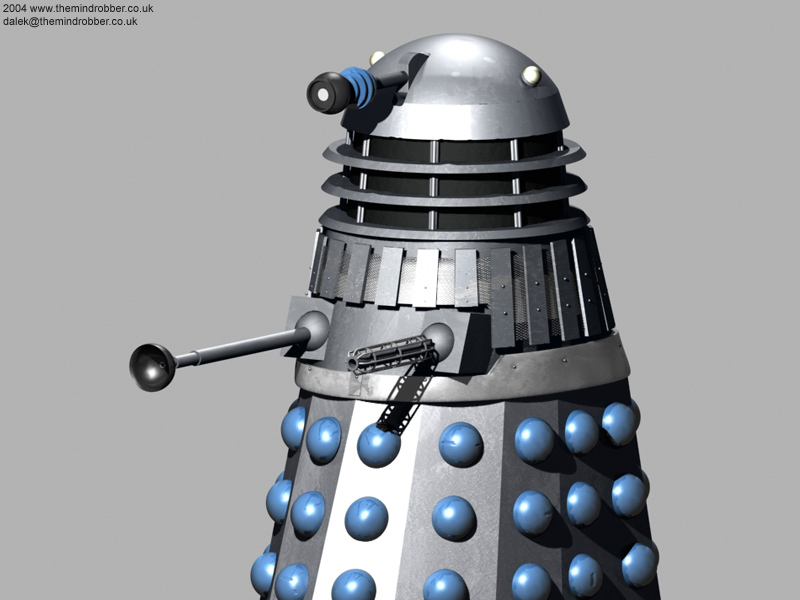 These old renders from 2004 show the earliest styles of Dalek. 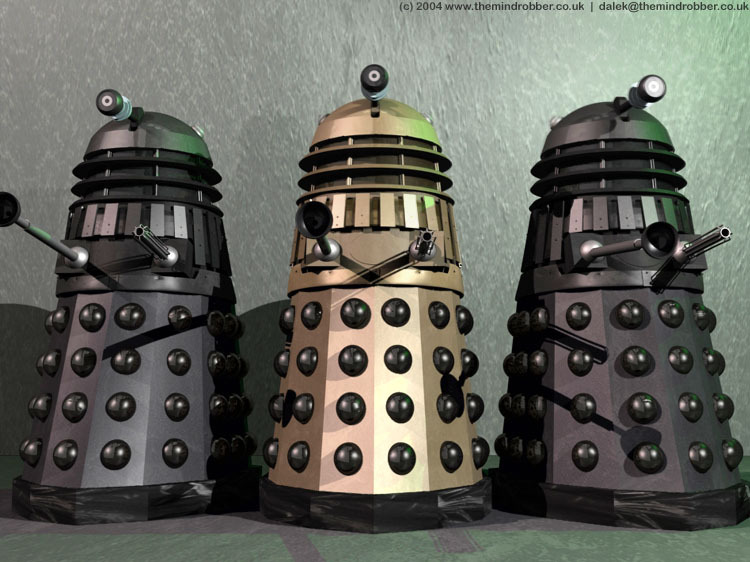 Above left is how the Daleks first appeared; the main difference is the lack of vertical slats around the shoulder section and also different lights on the head. Again something I came back to was creating a 'Dalek Invasion of Earth' style of Dalek (above centre).The hefty base (created so that larger wheels would allow filming on the streets of London) and the disc on the back are the main differences,along with a silver eye-piece ball on all but one of the normal daleks in thet story. 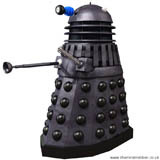 The Silver/Black and Black Daleks also had a black eye-ball. 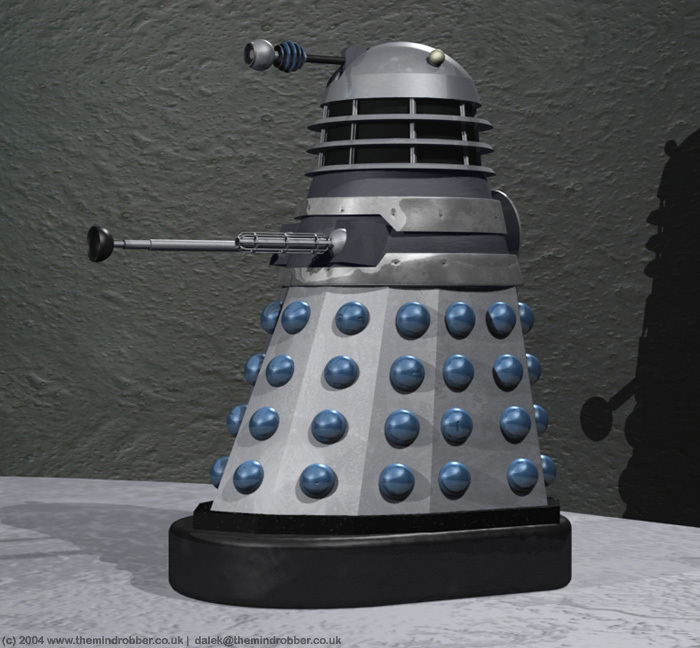 Below left is my 3D model of a classic 1965-style Dalek model. 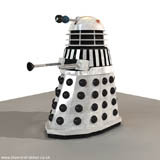 It originally started from the New Series Dalek but then rebuilt it based on plans found on the Dalek Modellers' website, however it was then tweaked extensively after being compared to screen shots from 'The Chase' and 'The Daleks' Masterplan'. The final touch was to weather the surface and dent and scratch the body to give a realistic appearance. I was fairly pleased with it at the time but now it looks crude. 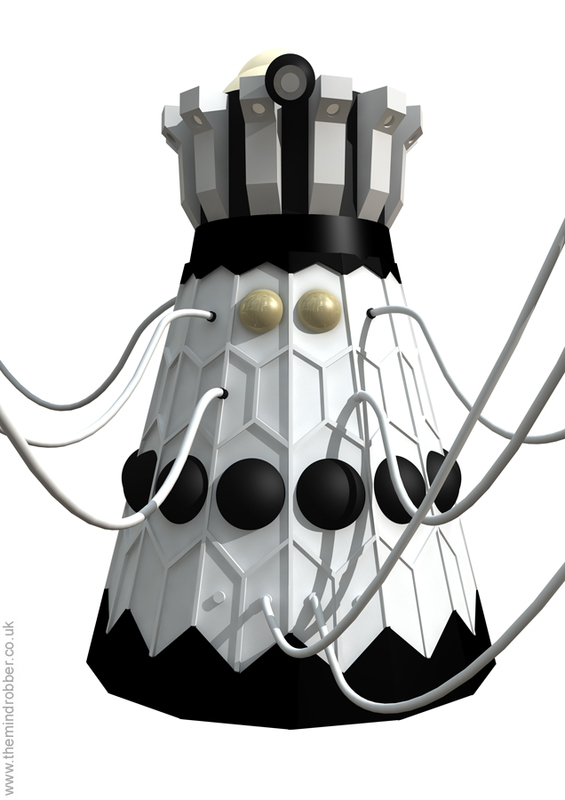 Having modelled the two main TV styles which cover all stories between 1963 and 1967 (with the exception of the Dalek Invasion of Earth) the next obvious model was Day of the Daleks which saw the Daleks return after a 5-year absense in a grey/black livery, plus that oddly coloured beige-gold leader. This shot (above centre) shows the Gold leader and its two lackeys from Day of the Daleks. 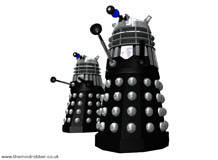 Subsequently they were seen in Frontier in Space (briefly) and then Planet of the Daleks. 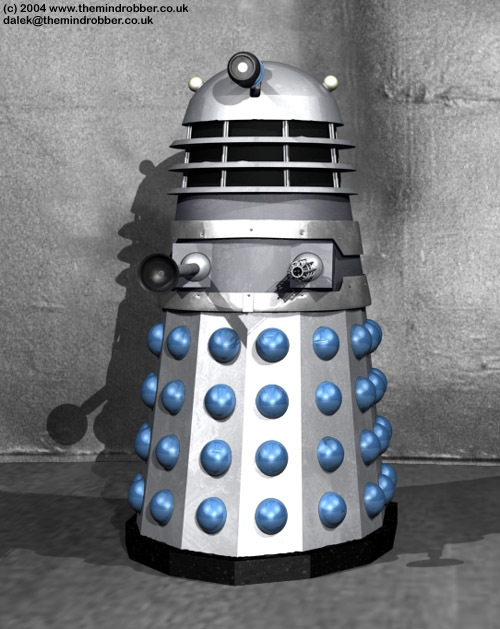 The grey/black colour scheme was skipped in Death to the Daleks only to return in Genesis of the Daleks just to create the irritating continuity problem concerning Genesis of the Daleks being set chronologically before The Daleks (or The Dead Planet, whichever you prefer to call it) unless of course you take The Doctor at his word in The Dalek Invasion of Earth which states that their previous encounter had been in the far future. 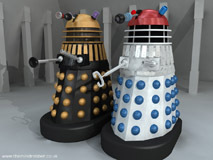 So, sandwiched between the Planet of the Daleks and Genesis of the Daleks occurences of the grey/black Daleks were the striking silver and black versions which appear only in Death to the Daleks (above right). And an oddity they are too. They are an odd collection which all have their differences. One has orange lights (although clearly not the leader at times), one has silver gun/arm joints (the others black), one has fewer eye-rings (four instead of five), and so on. Beyond these quirks the main modification is that of the gun. 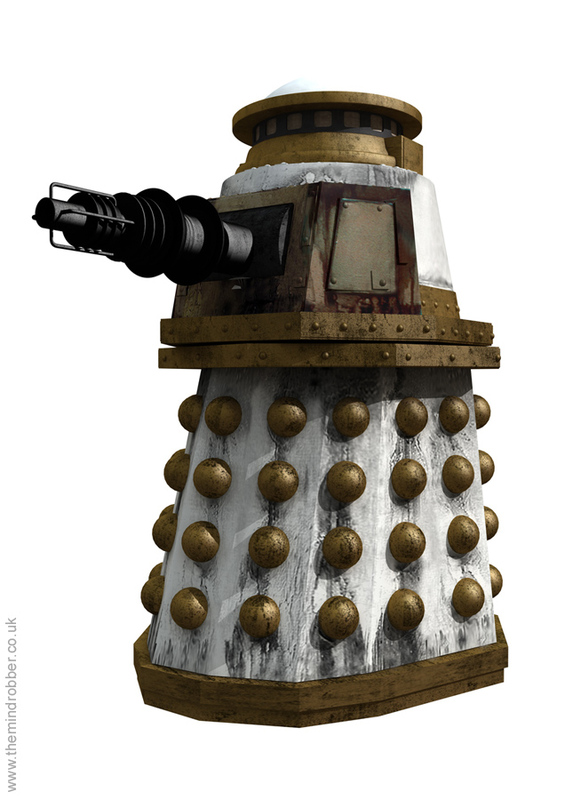 Deprived of their electrical power in this story the Daleks are forced back to the drawing board and come up with an ordinary ballistic weapon for killing purposes. 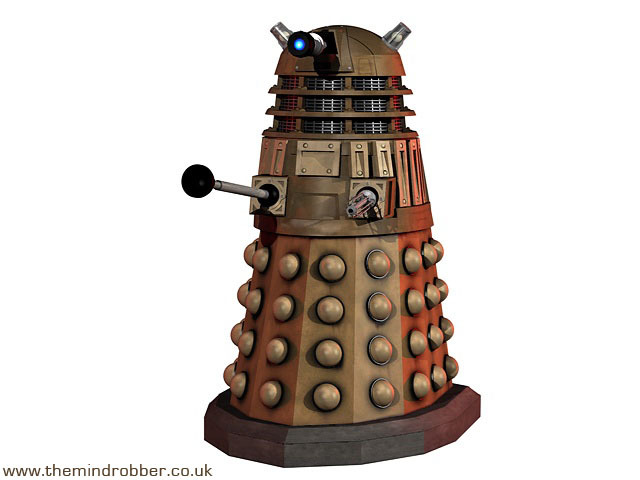 Coming right up to date the image on the right is the new series Dalek. 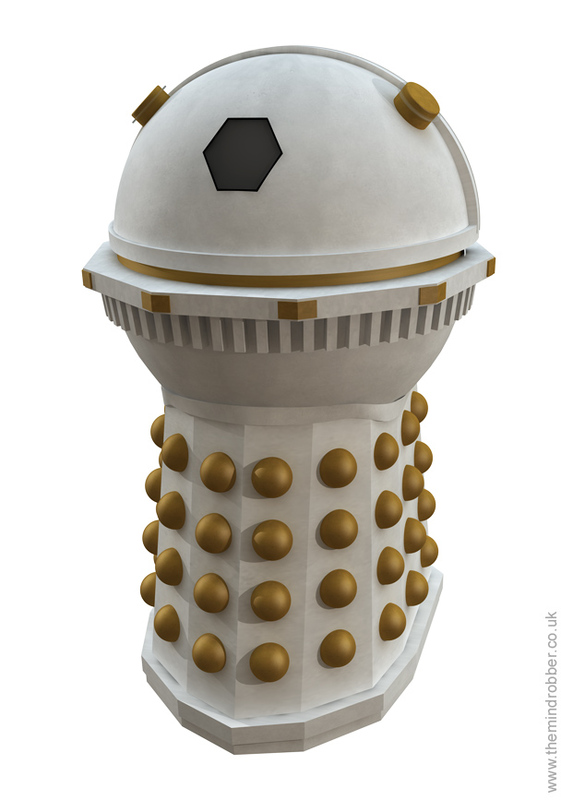 This was originally the Dalek I began first and worked it backwards into the original versions above. This one here is my third version though, extensively corrected for use on the DVDs. It's still far from perfect but I think it's good enough to get away with.